Poet and controversialist; born at Safi, Morocco, toward the end of the seventeenth century. He belonged on his mother's side to the Bedersi family of Provence. Left an orphan at an early age with an income sufficient for his wants, Kalifa traveled through Morocco. He stayed some time at Fez and studied there under Judah ben 'Aṭṭar and his successor, Samuel Ẓarfati. On his return home he continued his studies with the rabbi Joseph Bueno of Mescuta. By his independence of language and manner, Kalifa had the misfortune to displease the governor of Safi, and was obliged to take refuge at Agadir, a fortress on the coast. In 1728 the plague devastated this place, and Kalifa lost in one day his wife Deborah and his daughter Estrella. 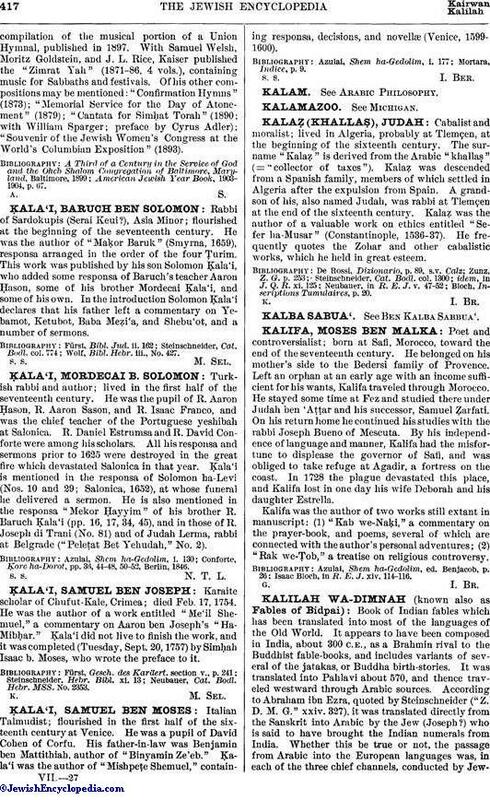 Kalifa was the author of two works still extant in manuscript: (1) "Kab we-Naḳi," a commentary on the prayer-book, and poems, several of which are connected with the author's personal adventures; (2) "Rak we-Ṭob," a treatise on religious controversy. Isaac Bloch, in R. E. J. xiv. 114-116.